Cauliflower is one of my favorite vegetables. In addition to being an extremely versatile ingredient, it is also extremely good for you. I always like to find ways to sneak this vegetable into my meals. Lately I have been seeing a lot of recipes around the web for cauliflower pizza crust, so I decided to create my own vegan version on the fly one night. What I came up with is not your typical eat with your hands pizza. It’s has a more fragile consistency, thus making it more of a fork and knife type of pizza. But, if you are looking for a healthy, nutrition-packed vehicle for all of your pizza toppings, this is a great option. 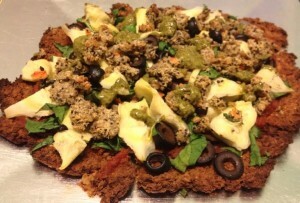 For this recipe, I used Shiitake Sunshine Burger crumbled on top of the pizza with all my favorite pizza toppings: Pomi marinara sauce, artichokes, spinach, and olives. However, feel free to get creative with your own toppings, and your variety of Sunshine Burger – the sky is the limit! 1 Shiitake Mushroom Sunshine Burger Patty, cooked or defrosted per package instructions. Grate 1 head of cauliflower with a box grater. Place the finely grated cauliflower pieces into a pot and add approximately 2 cups of water, (enough so that the cauliflower is about halfway covered in the pan) and a big pinch of salt. Heat the cauliflower with the lid on high heat until the water in the pan comes to a rolling boil, let boil for 1 minute, then remove from the heat. Strain the cauliflower in a colander and rinse with cold water to stop the cooking process. Carefully transfer the cooked cauliflower pieces into a nut milk bag and squeeze out any excess water from the cauliflower. Place the remaining cauliflower into a large mixing bowl and set aside. In a blender or a food processor add the pinto beans and olive oil and pulse until a smooth paste forms. You may need to stop the blender and remove the beans from the side of the blender cup with a spatula several times, but eventually a paste with the desired consistency with form. If not, add some additional olive oil. Transfer the bean paste to the bowl with the cauliflower and add the nutritional yeast, Italian seasoning, and garlic. Combine all the ingredients together with your hands and work into a ball. Transfer the ball to a parchment lined baking sheet. On the parchment sheet, push the ball down and carefully work it into a disk shape. Put the pizza disc into the oven for 45 minutes watching carefully to make sure that the edges don’t burn. Remove from the oven when the crust is a deep golden color and firm to the touch. Add sauce, toppings, and crumbled Sunshine Burger and place the pizza back in the oven for another 15 minutes until the spinach is wilted and the crumbles are lightly browned. *Originally, I thought white beans would be a great addition to this recipe, but half way through making this recipe I found that I only had pinto beans in my cupboard. Alas, the pinto beans worked perfectly, but if you happen to have white beans on hand, I am sure those would work splendidly, as well! ** My brand of parchment paper is recommended for temps up to 420 degrees F, check your specific brand of parchment paper to make sure that it is safe to use at the temperature that is called for in this recipe. This entry was posted in Dinner Recipes, Gluten-free Recipes, Sunshine Burger recipes, Vegan Recipes and tagged artichoke hearts, cauliflower, easy weeknight meals, Italian seasoning, low carb meals, marinara sauce, nutritional yeast, olives, Pesto, spinach, Sunshine Burger, vegan meals, vegan pizza. Bookmark the permalink.